The end of the war that was supposed to end all wars recently marked its hundredth anniversary. In commemoration of the event, the BBC has released filmmaker Peter Jackson’s (THE LORD OF THE RINGS and THE HOBBIT trilogies) magnum opus, THEY SHALL NOT GROW OLD. 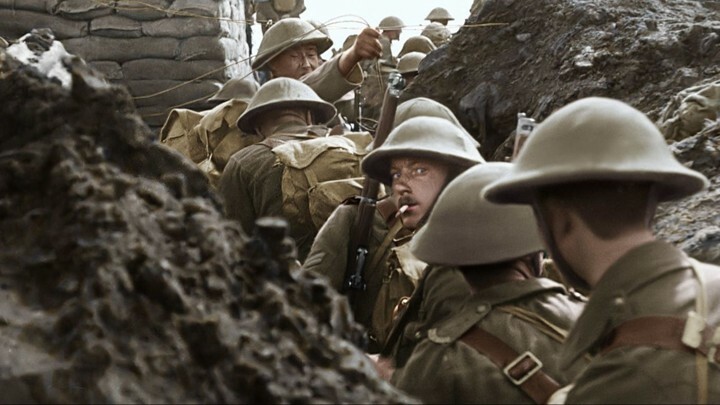 Using archival silent footage and audio recordings of the soldiers who fought in the Great War and survived, Jackson has created a visual masterpiece that will not only educate people for years to come, it will also be the gold standard for historical film restoration and presentation. Generations of students have no doubt fallen asleep while watching WWI footage in their darkened classrooms. (I know I did.) Those grainy, black and white images showing the blurred faces of men marching at some unnatural speed lacked intimacy. For most people, and not just kids, there was no connection between them and the men they saw up on the screen. To them, this was ancient history, not modern history. Jackson’s work has changed all that. Working from more than 600 hours of footage from England’s Imperial War Museum, Jackson and his team cleaned up the noise, adjusted the speed (much of the original footage was shot at a rate of 13 frames per second whereas today’s films are typically shot at 24 fps, which explains why it always seemed like the people in these old films were all experts in speedwalking), and colourised the images. For the first time we can see their faces and, wow!, so many of them were boys, some as young as 14, we learn. The images are so clear that we can see that many of them had rotting teeth, which is not so much a vivid display of the perils of bad dental hygiene but rather an indication of the socio-economic background of the majority of these lads. As the technology for synchronised sound was still in its infancy at that time, we never knew what these soldiers were saying or thinking as they prepared for battle. Employing lip readers and voice actors where possible, and using voiceover testimony from old BBC interviews with over 100 soldiers who survived the battles on the Western Front (where an estimated four million were killed), Jackson has finally given these men a voice that we can hear. If you ever thought that going off to war is glamorous, and these young men did, you’ll change your opinion after seeing it in 35 mm colour and hearing it in Dolby Atmos sound. It’s riveting viewing. I hope that someone in Germany will do the same with their old war footage, assuming it still exists. If they do, I’m sure we’ll all see how similar these old foes really were. THEY SHALL NOT GROW OLD is available in the UK on the BBC while Warner Bros. will be rolling it out to cinemas beginning in the US starting February 1st. I spoke with the WB representative here to find out if/when it will come to Hong Kong but he told me that he’s received no information on it yet. Hopefully the Hong Kong International Film Festival will be including it in their programme in April. Wherever you are, if you have a chance to see this amazing film, do it. Watch the review recorded on Facebook Live on Friday, February 1st at 8:30 am HK time!